It will be hotter. It will be drier, at times, and wetter at others. We’ll get less water from the Sierra Nevada snowpack, and the Pacific Ocean will rise and creep inland. But beyond those brute certainties, scientists, futurists, technologists, and entrepreneurs offer competing visions about how climate change will affect California in the decades to come. 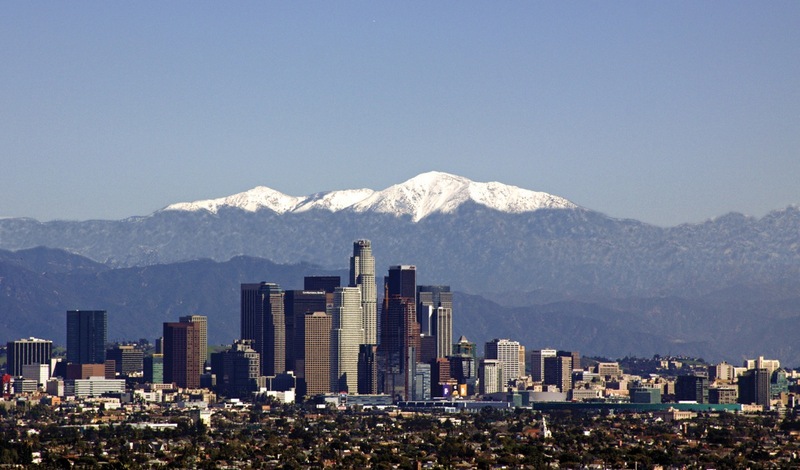 Average present-day snowfall in the Los Angeles region. Photograph by Bob Bernal; rendering by Jacob Cooper, Climate Resolve. If we choose to do nothing, the nightmare scenario plays out something like this: amid prolonged drought conditions, wildfires continuously burn across a dust-dry landscape, while potable water has become such a precious commodity that watering plants is a luxury only residents of elite, gated communities can afford. Decimated by fires, the power grid infrastructure that once distributed electricity—towers and wires—now loom as ghostly relics stripped of function. Along the coast, sea level rise has decimated beachfront properties while flooding from frequent superstorms has transformed underground systems, such as Bay Area Rapid Transit (BART), into an unintended, unmanaged sewer system. Short of the nightmare, realistically, California, like the rest of the world, will see temperatures rise over the next four decades. The California Climate Change Center predicts a rise in average temperature ranging from 1.8 degrees to 5.4 degrees by mid-century. By contrast, annual average global temperature increased a relatively moderate 1.8 degrees over the preceding 150 years, according to the National Oceanic and Atmospheric Administration. Some areas in California, inland and in the deserts, will get much hotter, with many more super-hot days in the summer. The sea level will rise along the coast. Polar ice melt-off combined with ocean water that expands in volume as temperatures rise will produce sea level increases from 5 to 24 inches south of Cape Mendocino, and up to 19 inches north of this geo-tectonic pivot point, according to recent simulation models produced by the Ocean Protection Council. The rising ocean will wipe away beaches and wreak havoc on some shoreline communities and infrastructure. San Francisco Bay Conservation and Development Commission Executive Director Larry Goldzband warns of the damages that could result from a bad weather trifecta in the Bay Area. “What happens if you get increasing sea level, a huge storm, and king tides, which happen when earth, sun, and moon come into alignment, all at once?” he asks. “Water from the bay spills into the city.” The Adapting to Rising Tides project predicts that the low-lying Oakland International Airport would be exposed to three or more feet of flooding during storm events with 16 inches of sea level rise. 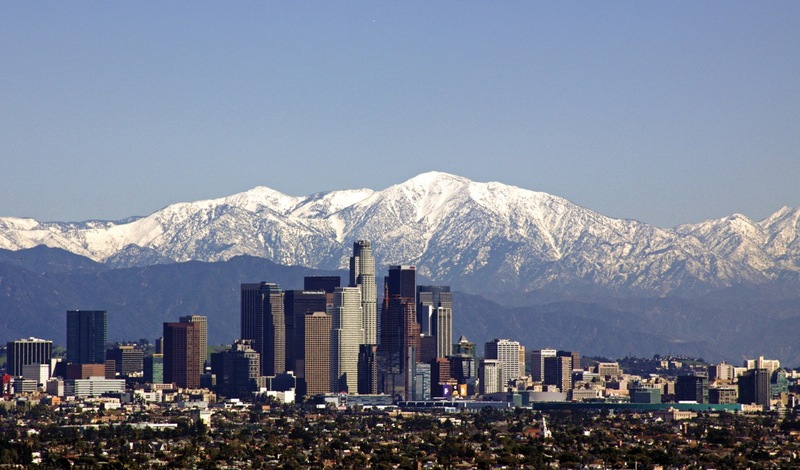 Potential impact of global warming on snowfall in the Los Angeles region by 2050. Photograph by Bob Bernal; rendering by Jacob Cooper, Climate Resolve. To the flooding, add fires. California’s three worst fire seasons have all occurred within the last ten years, according to the California Office of Environmental Health Hazard Assessment. Higher heat fosters tinderbox-like conditions that exacerbate human- and lightning-caused flames. California’s water supply, much of it sourced from snow pack in the Sierra Nevada, will decline. UCLA Institute of the Environment and Sustainability Director Glen MacDonald points out that roughly 80 percent of the state’s water is used to grow food. “When water becomes more scarce because of higher rates of evapotranspiration, how much water will we shift from our fields to our city?” he asks. Wherever our food will come from, it could be more expensive and there may be less of it. Warmer temperatures also translate into a shorter winter chill period that farmers count on to grow fruit and nuts in the Central Valley. The delicate balance of sunlight and mild temperatures that fostered ideal conditions for Northern California grape growers could be thrown out of whack. National Academy of Sciences research notes that vintners in Sonoma County and Napa Valley may be forced to relocate farther north as temperatures heat up. There is a clean, green, utopian scenario. Gasoline-fueled gridlock becomes the stuff of ancient urban legend as freeways set aside zero-carbon lanes for hydrogen-fueled vehicles and bicyclists. Agribusiness responds to arid conditions with hyperintensive farming techniques fertilized by their on-the-farm organic waste byproducts. Houses and commercial buildings generate their own power supplies with solar-paneled roofing, so homeowners happily share kilowatt surpluses with neighbors on a networked energy grid as easily as Facebook users now share online content, restaurant and reading recommendations, and instant messages. People will abandon their cars for other ways of getting around these green streets. In the Next 10.org study “Unraveling Ties to Petroleum,” UCLA-based lead author Juan Matute points out that public infrastructure has for decades rewarded the one-person-per-gas-fueled car lifestyle with hidden incentives. Envisioning the day when $80,000 parking privileges might become commonplace, Matute notes that the “Lone Driver” model historically flourished because consumers did not bear the true cost of public space devoted to free or cheap parking. In the future, he says, “If we reduce incentives for people to park on the street and decide that parking has a cost, we’ll probably see more transition to transit and ride-sharing.” The “ride share” concept, stubbornly ignored since its origins in the 1970s, is already quickly gaining traction thanks to profit-motivated, peer-to-peer jitney services like Uber, Lyft, and Sidecar. Matute produced a carbon-neutral scoping plan for Hermosa Beach pegged to the year 2075. “We assume a 95 percent transition to electric vehicles over that time period,” he says. “That seems to be the way things are going.” Since 2002, when GM crushed dozens of its experimental electric EV1 vehicles due to insufficient market demand, electric car fortunes have already rebounded, signaling a dramatic reduction in vehicular greenhouse gas emissions. In 2013 Tesla reported record revenues and announced plans for a lower-cost $35,000 electric car to supplement its Model S sedan. IBM’s Battery 500 Project aims to design lithium-air batteries that would boost the ability of electric cars to drive without a charge beyond their current 500-mile limit. The Environmental Protection Agency’s 1970 Clean Air Act dragged car manufacturers kicking and screaming into a forced-innovation mode that put an end to the smog alerts and spared Californians the pollution-clogged scenarios currently facing Mexico City, Beijing, and other exhaust-drenched urban centers. In the twenty-first century, government-engineered carrot-and-stick programs aim to similarly spur private sector ingenuity. While it’s too late to halt climate change in its tracks, state government policy encourages entrepreneurs, businessman, technologists, homeowners, and consumers to get with the same low- and even no-carbon vision for California. The California Energy Commission’s alternative and renewable fuel and vehicle technology program (created by Assembly Bill 118) invests nearly $90 million during the 2013 fiscal year to develop new transportation technologies, alternative and renewable fuels. California’s renewable portfolio standards mandate that 33 percent of the state’s energy production must come from renewable energy sources by the year 2020. The California Global Warming Solutions Act of 2006 mandates that greenhouse gas emissions be cut to1990 levels by 2020*. University of California, Los Angeles, researchers hope to wean Los Angeles completely from fossil fuels by then. 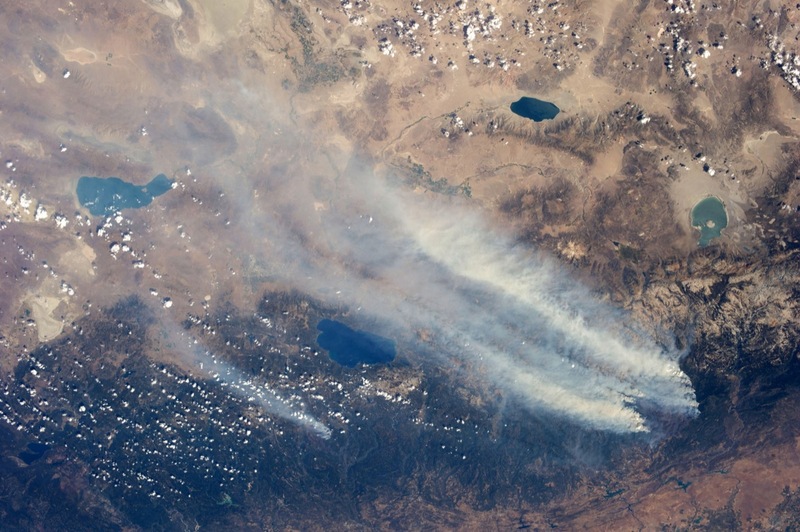 Smoke from the Rim Fire blowing east, as seen from the International Space Station on August 26, 2013. Photograph courtesy of NASA. Many renewable advocates regard nuclear energy as a dead issue in California, where state law prohibits the building of any new nuclear plants. But a contrarian cadre of environmentalists, including Whole Earth Catalog founder Stewart Brand, believe in the potential of fourth-generation nuclear reactors. Following California’s now-shuttered San Onofre reactor dysfunction and Japan’s catastrophic Fukijama meltdown, anti-nuke investors, politicians, and citizens will need a lot of convincing. Oakland-based Breakthrough Institute’s Michael Shellenberger, who produced a feasibility study on “How to Make Nuclear Cheap,” contends that nuclear energy deserves a second look. “New reactors need to be safe, need to be modular, and they need to be efficient,” he says—and he believes they can be. So what will it be? The good news? Or the bad news? Let’s not sit around waiting to find out. *An earlier version of this article stated that the California Global Warming Solutions Act mandated greenhouse gas emissions be 80 percent below 1990 levels by 2050. In fact they are to be cut to 1990 levels by 2020. Image at top is of the Ivanpah Solar Power Facility in the Mojave Desert, shown here with the Primm Golf Course in the foreground. Photograph courtesy of Brightsource Energy. California emits 1, 222,000 of Carbon Dioxide each day, that is 447 million tons a year, and the California Public Utility Commission is set to approve more Natural Gas Plants Why ? We need to Stop This Fossil Fuel, Global Warming Energy Policy and implement a Residential and Commercial Feed in Tariff through out the Nation, this petition, starts in California.